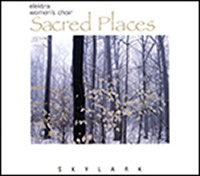 Elektra unveils an eloquent array of sacred works for treble voices, with contemporary pieces by composers from Hungary, Canada, the US, and Spain. Sacred Places includes György Orbán’s Mass No. 6; psalm settings by the late Srul Irving Glick; Eleanor Daley’s assured Os Justi; the haunting lullaby Durme, Durme arranged by Alice Parker; the glorious Set Me as a Seal by Richard Nance; Eva Ugalde’s dramatic Miserere; and Gwyneth Walker’s I Thank You God. This moving collection is the very essence of Elektra—transcendent harmonies, thrilling melodies, and a full vocal spectrum.